our rich historical approach of participatory innovation as we engage in co-discovery in our cities. There have always been elements of innovation and entrepreneurship in public sector organizations (Jordan, 1990; Moore, 1983). Creating value for customers, putting resources together in unique ways, and being opportunity-driven are not inherently in conflict with the purpose of public organizations (Morris & Kuratko, 2002). Option 1. 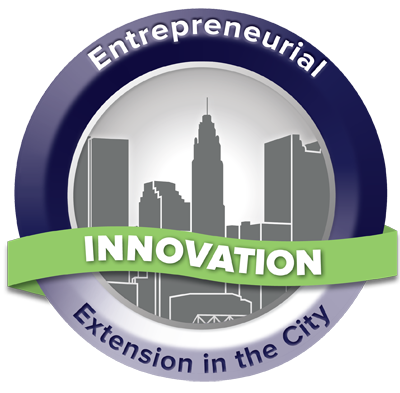 The Entrepreneurial Innovation Introductory Guide addresses the rapidly changing landscape in urban areas throughout the country. Innovation is essential for cities and for universities. Ready to get started? Follow this link or download this PDF. Awareness of entrepreneurial innovation context. Knowledge of the innovation process. Ability to manage a customer-focused experience and product portfolio. Participants can earn a digital badge to demonstrate their knowledge and expertise. Ready to get started? Follow this link to learn more about the Digital Badge program and to register to participate.